When I was working on this recipe, I couldn’t even get it to the table without 6 forks going into the pan to eat it up. So, I am so excited to give you this recipe! And I’m excited to bring this to you as a partnership I have with Unilever® as an Agent of Change. I am one of several dietitians across the country who work together to bring food that tastes good, does good and doesn’t cost the earth to our families, friends and communities. I am so blessed to work with incredible people. Speaking of incredible people, I consider my little girl and little boy in that category, too. And more often than not, they are in the kitchen helping my recipe creation, and doing some of their own (any parents know that bowl of water plus every spice from the cabinet all swirling together?) Well, because of growing families, some of my most requested recipes are one-pot and one-pan ideas. One pan recipes are something I adore – the side and the protein bakes together…for easier cooking, and easier clean up. 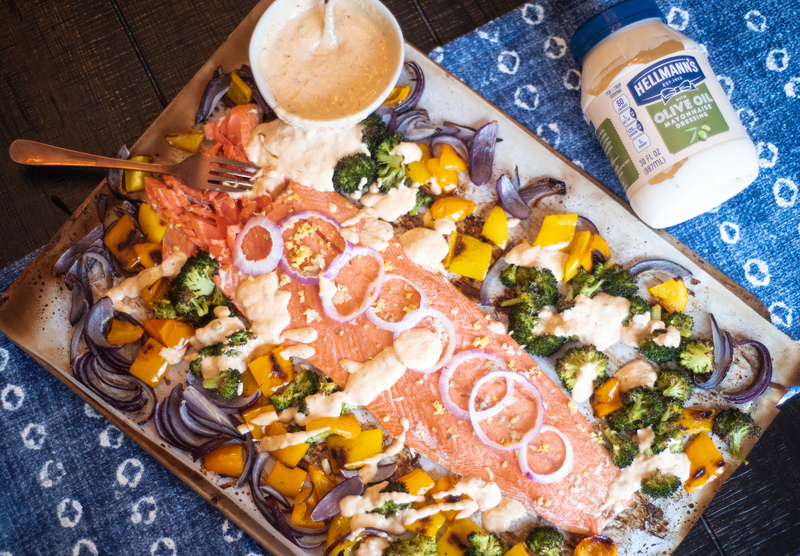 So today, I bring you this One Pan Salmon with a crazy, amazing sauce using Hellmann’s! Here we go: first, mix veggies with olive oil and salt and spread out on one pan – add fresh broccoli, chunks of red bell pepper, and red onion. Always bake it on high heat….this time on 415. Fish can seem intimidating to cook – but really, if you cook chicken, it’s 10 times simpler! I use a salmon filet that is a little over a pound, and I prefer one that the skin is still on. You’ll cook it skin-side-down, and after it is cooked, not only does it become edible, but you hardly notice it. Slather that salmon with fresh garlic, lemon zest, salt, and then put some red onion rings over the top. The most important, I repeat, most important thing to remember when cooking salmon is: never, ever, ever overcook it. A good rule is 4 minutes per half-inch thickness. So, for this salmon, 15 minutes only. Next, we will make a sauce. It’s a creamy, gingery, garlicky sauce, and I hope you’ll want to slather it on everything. It starts with a half cup of Hellmann’s® Mayonnaise Dressing with Olive Oil , which is has a creamy, rich taste paired beautifully with the delicious goodness of olive oil. I’ve loved Hellmann’s® since I was a little girl. Since I already had an affinity for it, I was pleased to learn that they use 100% cage-free eggs and source their ingredients from trusted American Farms. As a kid, mom would spread Hellmann’s® on every sandwich and burger we ate. But, now as a food lover and creator, I take it and do a million other things with it! 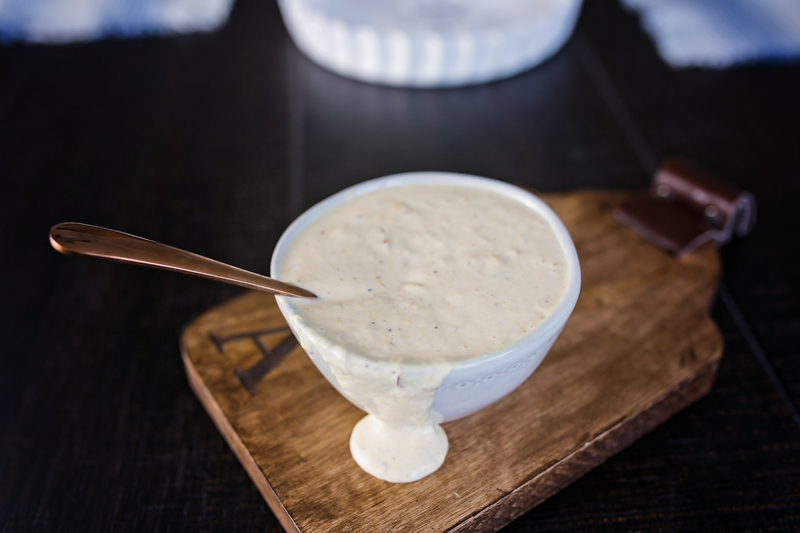 My favorite is dressings and dips….if you know me you know I am the QUEEN of sauces. Add some grated garlic, fresh grated ginger, and lemon juice to cut through the fat, and add a tangy kick. Then, here is the secret. Place 1 cup of the roasted vegetables from the pan into the sauce. Just pick out the onion and bell pepper. 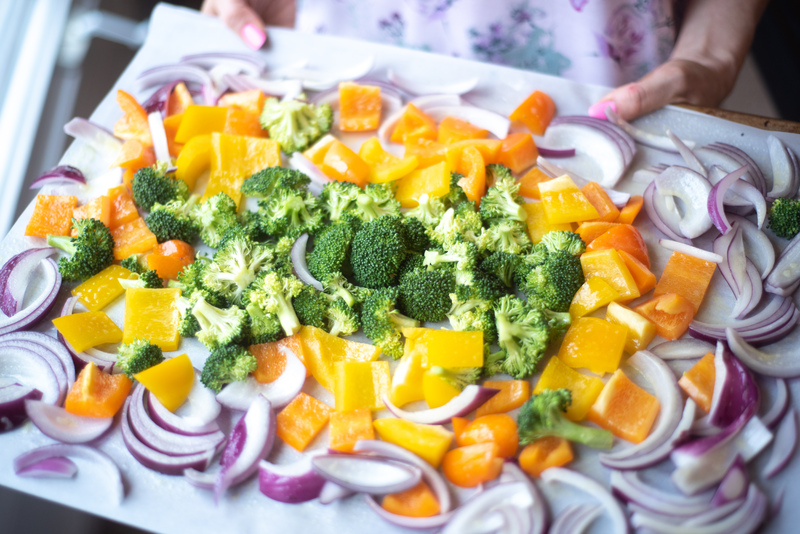 Trust me, keep the broccoli on the baking sheet…. Put that all into the food processor and blend. 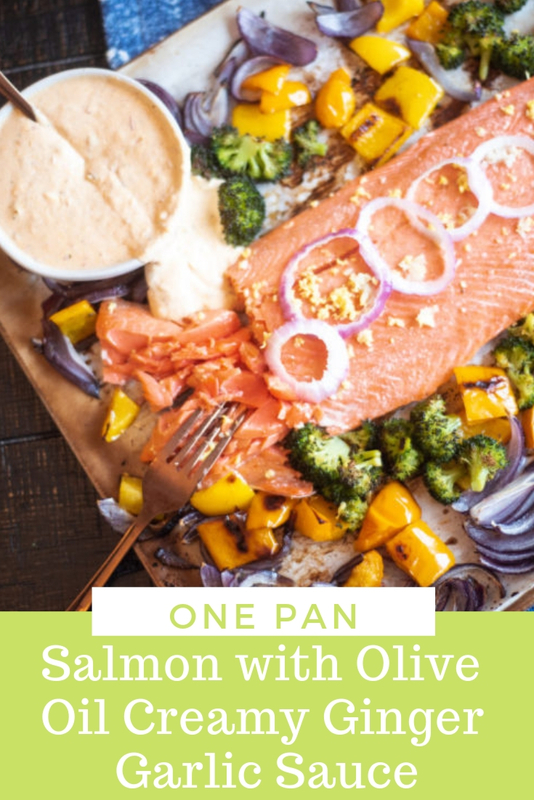 Now you have a DELICIOUS sauce that goes perfectly with roasted salmon…..and everything else you can think of. 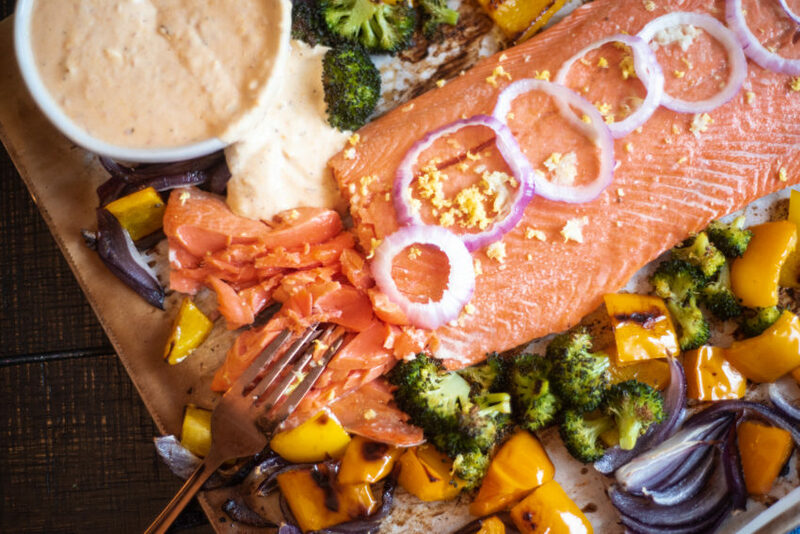 Salmon should be cooked perfectly by now….serve it at the table just as-is! 2. In a bowl, toss chopped onions, broccoli florets, and bell pepper chunks with 2 tablespoons olive oil, garlic and 1/2 teaspoon salt. Arrange in a single layer on a parchment-covered baking sheet. Roast for 20 minutes. 3. 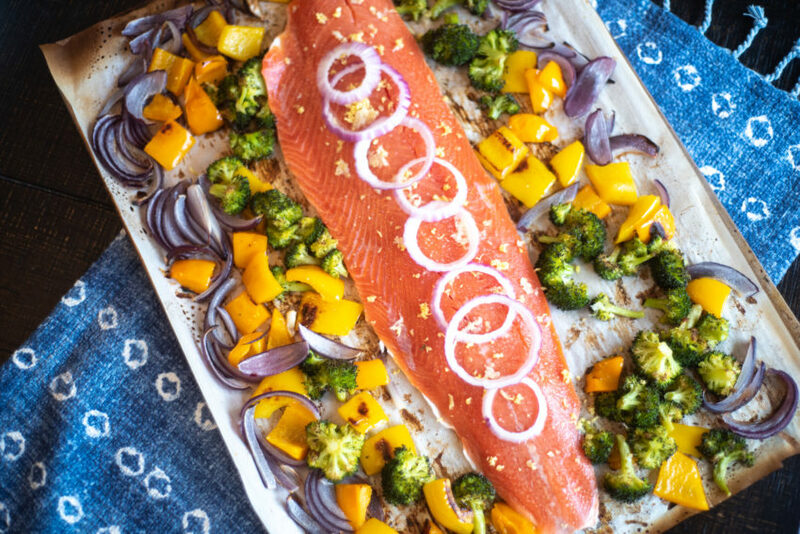 Remove vegetables from oven and add salmon filet to the middle of the baking sheet, pushing vegetables to the sides. Season the top of the salmon with 2 teaspoons of olive oil, then rub with the grated garlic and lemon zest. Sprinkle salt over the salmon. Finally, arrange a few onion slices on top of the salmon. 3. Put back in the oven and bake for 15 minutes. 4. Remove baking sheet from oven. 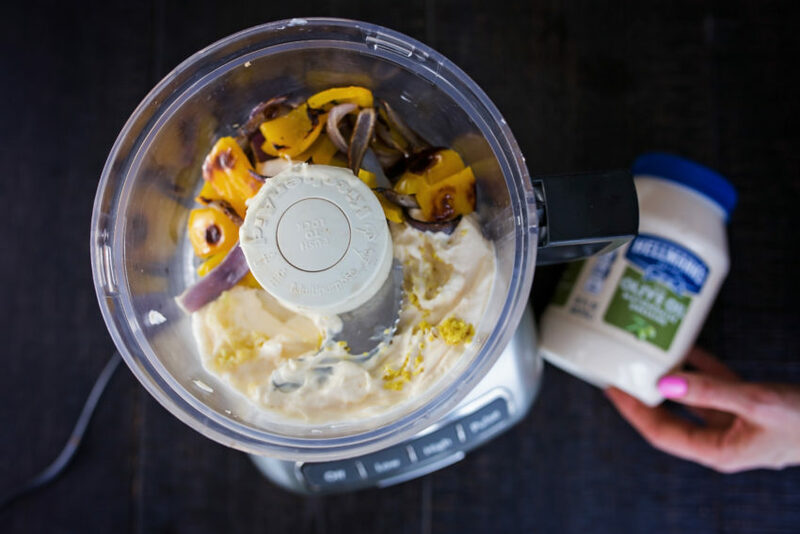 In a food processor, add ingredients to make sauce: Hellmann’s® mayonnaise, lemon juice, garlic, ginger, and 1/4 teaspoon salt. 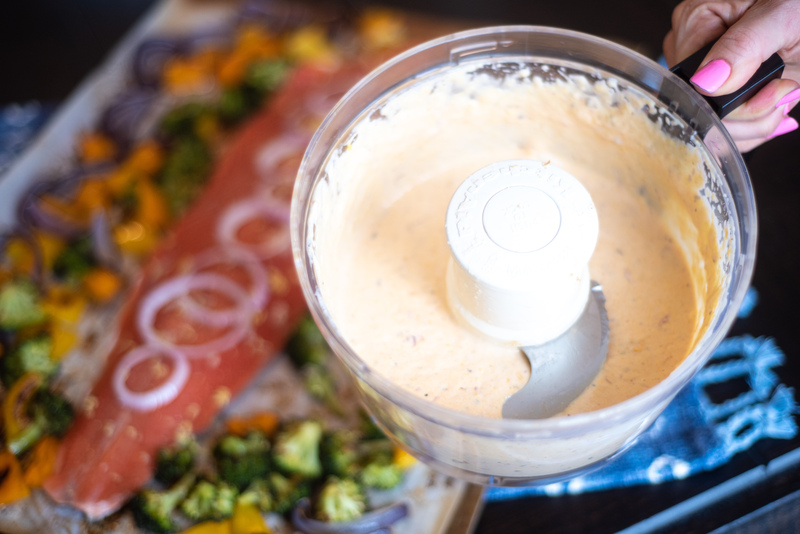 Carefully measure out a cup of the roasted bell pepper and onion and add to the processor. Process on high until smooth and creamy. 5. 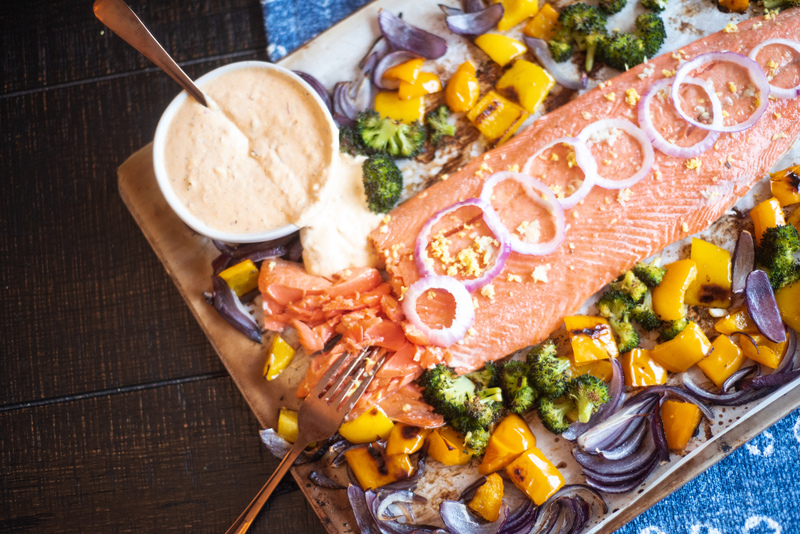 Serve salmon and vegetables with sauce on the side. Enjoy immediately!